Russia and the West: Do populist politicians offer a real alternative? The meteoric rise of left-wing iconoclast Jeremy Corbyn, the favorite in the leadership contest for Britain’s Labor party, raised the question: Where is Labor, and Britain too, heading? Corbyn, if he ever wins the premiership, would be allegedly the most sympathetic British leader to Russia in history. This would be unprecedented, because Britain, as proclaimed by conservative Russian politician Vladimir Zhirinovsky, has been Russia’s “most formidable enemy” since the 19th century. In contrast, Corbyn is adamant in his foreign policy pronouncements, and he believes in what he says. He lambasts NATO and blames the West for instigating the Ukrainian crisis. But does he really epitomize a true alternative? And is he one of the new breed of politicians who are now making waves, or a throwback to the past? A growing number of statements in the West favoring improved relations with Russia have accumulated in recent months, bolstered by acts of defiance of the common EU and U.S. stance in regard to Moscow’s foreign policy. This was manifested by the visit of French parliamentarians to Crimea and a similar move planned by a group of their Italian counterparts. Moreover, the political debate in Europe and to a lesser extent in the United States, partly due to pre-election campaigns, has acquired a fair degree of criticism of governments’ standpoint on dealing with Russia. This no longer looks like “one-off” soundbites. The demand for a “reset” is coming from politicians of various political leanings, from both the right and the left. From frontrunner in the Republican nomination race Donald Trump in the U.S. to Jeremy Corbyn in the UK; from Marine le Pen, leader of France’s National Front, with a strong bid for the presidency, to Matteo Salvini, leader of Italy’s Northern League; from President of the Czech Republic Miloš Zeman to Prime minister of Greece Alexis Tsipras. Yet, Jeremy Corbyn’s opponents consider the British maverick a “dinosaur” of left-wing politics, having spent 33 years at Westminster. However, this has not deterred the support of the trade unions and the 10,000 volunteers who promoted his candidacy. It all points to a clear desire in certain sections of the public for change. Although Corbyn has warned not to take him for “an advocate” of Russian President Vladimir Putin, he calls for bettering relations with Russia. Foreign policy has unexpectedly soared close to the top of the agenda of election campaigns, compelling politicians to define their views regarding the current global situation. It has also contributed to the ratings of those public figures that are suggesting an alternative, like Trump, who claims he could do a better “jaw-jaw” with Putin than Obama. - What about the “Russian connection”? - Why would politicians as different as Trump, Tsipras, Le Pen, Corbyn, etc. criticize the political establishment in their countries for conducting what they deem as an incorrect policy toward Russia? Among those who are allegedly “playing the Russian card,” Marine Le Pen of the France’s National Front is quite visible: She calls for tighter energy and military cooperation with Russia, and once invited Germany to jointly create a Paris-Berlin-Moscow axis. Then there is the UKIP leader Nigel Farage, who has called on the European Union to stop interfering with the Ukrainian crisis and engage Russia to form a united front against the Islamic State (ISIS) militant group, which is conducting a war of terror in the Middle East. In Berlin, Alexander Gauland, the leader of the Alternative für Deutschland (AfD) Party, argues that 19th-century chancellor Otto von Bismarck was correct in insisting on close ties with Russia, because each time Germany abandoned Bismarck’s paradigm it headed toward defeat, most notably after 1914 and 1941. In Moscow, conservative political groupings held a forum in March, inviting 11 like-minded political parties from Europe. Among those present were senior figures from Greece’s controversial Golden Dawn and the Austrian Freedom Party. The get-together marked attempts to establish a sort of “right-wing international” but the outcome was more style than substance, much like the hopes of staking much on marginal politicians like Jeremy Corbyn. Nevertheless, the Corbyn phenomenon and similar offshoots of the counter-elites in Greece, Italy, France, Germany, and the Netherlands, not to forget the U.S., has revealed the latent demand among many of the public for a viable alternative to the mainstream politicians and policies which have ceased to meet the high expectations of the people. The bottom line is: Never underestimate an anti-establishment maverick during the “lean years” of frustration and despondency. Even though it might boil down to nothing more than 15 minutes of glory and razzamatazz. Last week Moscow unexpectedly stepped into the debate over the European refugee crisis amid the deepening calamity that has pitted Eastern Europe against Western Europe, with Russian President Vladimir Putin suggesting resolving this conflict of interests by addressing its root causes. Meanwhile, his diplomats hinted at Russia getting involved in the efforts to diffuse the avalanche-like crisis. In some way, Putin echoed the decision taken by the EU in July to tackle the core roots of the crisis. That decision was based on the premises that war-torn and hunger-stricken, destabilized nations serve as breeding grounds for extremism of all kinds, making way for the emergence of violent religious fundamentalists who preach by the sword and live by hatred. Nation-building and restoring the fractured societies of these countries is vital. In late August, Russian Foreign Minister Sergei Lavrov suggested Russia and the EU could interact in handling the refugee crisis. Moscow is awaiting concrete proposals from Brussels, said Lavrov. Concurrently, diplomatic sources revealed that “informal” consultations on the subject with the EU have been going on for some time already. Also for the record: Since the start of the civil war in Syria, some 5,000 refugees have fled to Russia, and many of them have applied for permanent residency status. While pointing at the “reckless” politics pursued by Western powers in the Middle East and North Africa, which triggered off the exodus of refugees, Russian Foreign Ministry spokeswoman Maria Zakharova has proposed substantial cooperation with the EU in handling the crisis. Could Russia really assist the European Union in handling the consequences of the migrant crisis? If so, could it become another focus point of positive interaction between Russia and the EU in dealing with a trans-border issue? The Moscow-based academics have slightly divergent views on whether Russia should “do its bit” and what are the limits to its good will and contribution. “First, from the perspective of international politics, Russia has no obligations to pay for the mistakes of the European leaders, namely France and Britain, as well as the United States, which they made in the Middle East and which is the core reason for the refugee crisis. Second, Russia is also suffering from an influx of refugees from Ukraine, [which is] going through a crisis to which the Europeans have contributed. “I believe that Russia should be more active in this field because the flow of refugees is huge. It is evident that the ‘buffer zones’ in Libya, in the Maghreb countries, and in the Middle East, ceased to exist after the Arab Spring. There are conflicts going on in Iraq, Syria, and Libya. Russia is interested in a settlement in these countries. Henceforth, it must pursuit, in my opinion, a two-track policy. In any case, the goodwill gestures made by top Russian officials signal the desire of Moscow not just to keep channels of communication open but to cooperate with the European Union in a meaningful and effective way, and deal with a problem that spans across three continents and has not a regional but a global dimension. Moscow missed the opportunity to welcome Saudi Arabia’s new monarch, King Salman, in August prior to his first official visit to Washington this week. Nevertheless, it makes little difference since the new visible corrections in the foreign policy of the desert kingdom counterbalance Riyadh’s former leaning toward the West. There is no doubt that for decades Saudi Arabia has appreciated the “special relationship” with the former main provider of security in the region, the United States. The 9/11 drama was a watershed: The allegations of the close ties of the terrorists to Saudi Arabia derailed everything. These accusations in the American media led Saudi business and sovereign funds to withdraw some $200bn as portfolio investments from the U.S. stock markets. Damage control was applied, and things returned to the way they were for a while – until the U.S. strategists, enthusiastic about becoming energy self-sufficient and less dependent on Middle Eastern oil, shifted their foreign policy emphasis and focused on engaging Iran. The Vienna deal on the country’s nuclear program set the course of events toward lifting the sanctions from Tehran, seen by Riyadh as its arch-rival in regional affairs. “Saudi Arabia is trying to find new ways of handling international politics. For decades Riyadh was a close friend of Washington. Now that the two sides share a serious ‘misunderstanding,’ the Saudis are looking for new international partners, including Russia. “There is an element of a game in the Saudis’ behaviour, in how they are balancing relations with Moscow and Washington. However, the context is that they are extremely concerned over the challenges that they face in the immediate neighborhood. It forces them to act more pragmatically than they did before. “As for Washington, the two sides will cover five problem areas: Syria, Yemen, Egypt, the energy issue and, of course, the Iranian deal. On all of these issues Riyadh and Washington have serious disagreements. But the deal with Iran will dominate the agenda. Obama wants to ease the Saudis’ concerns over the deal, and get, if not support for it, non-resistance to its implementation. — What is store for Russia if – or rather, when – King Salman finally pays his promised visit to Moscow? “The Saudis are trying to diversify their contacts with Moscow and Washington. As we know, Prince Mohammed bin Salman attended the St. Petersburg International Economic Forum this summer, and the two parties allegedly clinched a very lucrative arms deal. It would be premature to expect a full-fledged cooperation between Moscow and Riyadh, given the multitude of divergent views and interests. 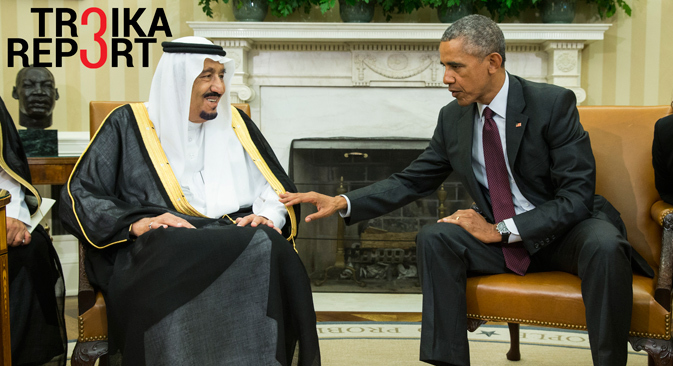 The House of Saud is too careful and pragmatic enough not to rupture its close ties with Washington. Yet, the current restructuring of the whole situation in the Middle East, driven by the gradual strengthening of Iran and the entrenchment of ISIS, which already controls 70 percent of Syria and a large chunk of Iraqi territory, forces Saudi Arabia to seek, if not new allies, then new partners of convenience to deal with the existential threats.